… it’s as hard to summarise as anything he wrote. You might get a general idea by imagining Richmal Crompton’s William Brown books, rewritten by Tom Sharpe and Roald Dahl in a mix of Withnailian high style and broad Kiwi slang, but even that wouldn’t catch the genuinely troubling surrealism that creeps about at the edges of Morrieson’s story. 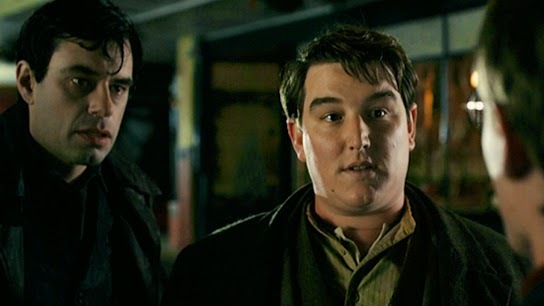 The 2010 movie featured Jemaine Clement, above left. No, I haven’t seen it either. Ms Ardern said her mother's maiden name was Bottomley with her grandparents formerly living in Welcome Bay. “So I feel like I have that nice little connection to Bottomley Potts,” she said. Photo by Ruth Keber for the Bay of Plenty Times. Which should give e-book self-publishers pause for thought. Is your e-book future-proof? Will it be readable on the next generation of e-book readers, or the one after that? A tech-savvy friend who works in this area says: probably not, especially if you converted it from a Word document, as many people do. This stuff is much harder than it looks. I was listening to AC Grayling in Brighton recently constructing this complex and fascinating argument about where religion came from. I thought, ‘Where else would I be able to hear this and have the opportunity of asking him questions?’ I’m not sure I’d find it on television anymore. I think festivals have stepped into that intellectual space that television has left behind. Best remembered for her superb historical fiction and tragi-comic tales of working-class life, she was a one-off, writing with quirky wit, concision and originality in a manner that was always fresh and surprising, sometimes macabre and shocking – and entirely sui generis. This makes her a writer difficult to catch or categorise, and one wonders where her reputation will ultimately rest: five times runner-up for the Booker Prize, she never did anything big or mainstream. Is she simply a fluent raconteur, spinning excellent yarns, a subtle literary miniaturist or something altogether darker and more elusive? With the eye of a novelist Mr Birmingham enlivens his story with details about these forgotten characters: how the judge who ultimately overturned the ban in America wore a tie when playing tennis and how the British lawyer who declared that the novel was “filthy, and filthy books are not allowed to be imported into this country” disliked cars, even as late as the 1950s. How to move 500,000 books 100 metres. Amazon may seem like your best friend right now, but so it also seemed to traditional publishers when it appeared in the late 1990s, as a counterbalance to chain bookstores. A self-publisher is still a publisher and occasionally all publishers clash with the retailers who bring their wares to market. Enter the world of Birtwistle and you do so on his terms. I heard the leader of the BBC Symphony Orchestra talk of smashing his violin after barely managing to negotiate the world premiere of Earth Dances — for me, the most aptly named, riotous work for orchestra since Stravinsky’s Rite of Spring. Harry wasn’t bothered. I wonder how many of us Hamilton City dwellers really appreciate living; and doing business in a city whose logo depicts one of scum, filth and defilement? For such is the title, and image of one Riff-Raff, imposed upon us by those who have apparently twisted understandings and rebellious hearts. These people who are like impudent children,– spoilt brats,– who appear to be given their heart’s desire in whatever abased area of human depravity that can be legally applied now– allowed by the arm of a false-freedom, encouraged by newly, perverted legislation, standing proudly opposed to the righteous ways that have held us,– sure and steadfast, for many generations past. Are we both ashamed and offended to live under this banner of darkness, that is fluttering over our community? We should be. All of us in Hamilton hold the deeds of ownership to this state of affairs; and very few, if any at all, have spoken out against this flood of darkness descending freely upon our city; preferring to allow the applause of fools to apply consent to the violent waves of deeper darkness fast approaching. 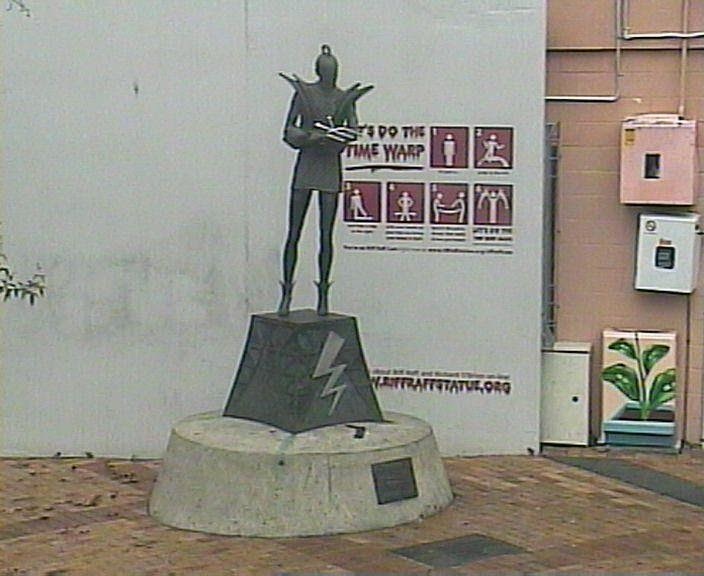 A note for non-Hamiltonians: “Riff-Raff” refers to this bronze statue in Hamilton’s Victoria Street (it was unveiled on 26 November 2004) of the character Riff Raff from The Rocky Horror Show, as performed by former Hamiltonian Richard O’Brien, who also wrote the show. I met him once in the green room at TVNZ: he was very nice, and we chatted about our mutual alma mater, Tauranga Boys’ College. Last year he remarried and now lives in Katikati. Thanks for the interest in the PANZ Book Design Awards, Stephen. The Publishers Association decided a few years back that the best judges for book design awards were people who actually design books — and that the judges we wanted were the very best in that field. And each year we also have a lay judge (this year, Noelle McCarthy) to speak for the book consumer. To have the best book designers as judges means that some of them will have entries in the awards. The BEST design awards have a similar issue — design practitioners judging other practitioners, and their own work often being in the finals list. It works, and isn’t an issue, because there are clear procedures in place for the judges to recuse themselves and to exert independence. PANZ also have clear procedures for dealing with these issues as they arise. We’re happy with the high calibre of the judges and the integrity of the decision-making process. Too few women? It has turned out, for various reasons, that this year Noelle is the sole woman judge but that hasn’t been the balance in past judging line-ups. We don’t believe it’s useful to operate a rigid quota system. @GuySomerset @samelworthy @StephenStra I'm a finalist this year & I would def prefer to have designers as judges, finalists or not. Today the Publishers Association of New Zealand, aka PANZ, announced the shortlists in its 2014 Book Design Awards. Congratulations to all finalists – all the books I have seen are very worthy. But. There are seven categories: best illustrated book; best non-illustrated book; best children’s book; best educational book; best cookbook; best typography; and best cover. There are four judges: convenor Gideon Keith, a book designer; Alan Deare, a book designer; Cameon Gibb, a graphic designer; and Noelle McCarthy, a broadcaster and book reviewer. This is not meant as a criticism of the judges: I am sure that proper process was followed in the judging and that any judge under consideration left the room when his book was being discussed. But it’s not a good look, is it. This is not the judges’ fault – it is the organiser’s fault. Looking at you, PANZ. None of the judges should have been put in this position – the Montana/NZ Post awards were always very good about making sure this visible conflict of interest could never happen. When I was a judge of the design awards a decade ago with Adrian Clapperton and Dorothy Vinicombe, none of us was working as a book designer though Adrian had a lot of magazine design experience, I had a little and we all had book nous, especially Dorothy. Other panels I recall from that time were the same – never a possibility of a conflict of interest. Also: book design is dominated by women. It’s a bit odd not to have a design-literate or design-experienced woman on the panel. These awards are really good, really valuable. But they won’t be taken seriously if they are run like this. To Tauranga last weekend to do two sessions at Escape!, their mini literary festival. It was very good – well-organised, a wide range of authors, good attendance and, as always at these events, good gossip from the authors. One told me about her recent experience with a Certain Major Publisher. In a chapter on Roman food, i.e. from Rome 2000 years ago, she wrote that they couldn’t use ingredients from the new world such as tomatoes, potatoes and corn. The editor corrected this to “from New World”. The author changed it back to “from the new world” on the page proofs. The editor corrected this again to “from New World”. The author changed it back again to “from the new world” on the second set of page proofs . This must have annoyed the editor, because on the final set she changed it to “from the supermarket”.